Here’s his latest thoughts on Brexit and pensioners in Canada who receive the UK State Pension. All views are the CABP’s and Brits in Toronto does not endorse them and is not held liable in any way. As always, do your due diligence. I was recently speaking to my octogenarian friend James the other day (you may remember that I first introduced you to James in the Ouch! How Brexit is hurting UK pensioners in Canada and in the later article James and I go to London), and I said to him what a quintessentially European phrase, “Nothing is agreed until everything is agreed” really is, although its origins seem to come from the World Trade Organisation (WTO) in 2005. What has this got to do with the UK State Pension which is what James and I always end up talking about? You see, he is a British military chap and he is usually found frothing at the mouth because he has found out that if he had stayed in the UK rather than retiring here to Canada he would be more than £31,000 better off in terms of his UK State Pension; using historic exchange rates, this converts to over $56,000 — not a trifling amount by any means. If James lived south of the Niagara Falls (in the US) he would have been getting the annual increases to his UK State Pension. Instead, he chose to live north of the Falls, here in Canada and he hasn’t been getting the annual increases, and his UK State Pension has been “frozen.” How unfair is that? Once the UK drops out of Europe, then, technically, the UK government no longer has a legal obligation to continue giving these pensioners the annual inflationary increase. This year the increase is 3%, so, for anyone getting their UK State Pension based on the pre-2016 Pensions Bill, this means an increase of just over £190 per year. Those who have retired after April 2016 will receive up to an estimated £260. These pensioners are not happy about the possibility of them losing the annual increase, and there are a number of European pension lobby groups who are petitioning the UK Parliament. The European Parliament and the UK Government have agreed that the UK government will continue to “export benefits” which includes the annual increase to the UK State Pension, and that has been drafted into the Withdrawal Bill which is currently before the UK Parliament. This is fine as long as the Withdrawal Bill is enacted. However, Brexit negotiations are currently getting bogged down with negotiating a trade agreement. If the negotiations are not all completed by March 27, 2019, then the UK could fall out of the EU, and the Withdrawal Bill could be in limbo. So, where would this leave the pensioners living in Europe who receive a UK State Pension? As you can see, Canada is one of those countries (where there are 144,000 “frozen” pensioners). The pension lobby groups that I represent are watching very carefully to see what Brexit delivers in terms of the annual UK State Pension increase. Technically, the pensioners living in Europe will be joining all the other “frozen” UK pensioners in the world, and the number would then swell to over one million unhappy pensioners — not a pleasant sight! This entry was posted in Uncategorized and tagged brexit, british state pension, brits in toronto, cabp, canadian alliance of british pensioners, canadian association of british pensioners, international consortium of british pensioners, nigel nelson, uk pension, uk state pension on March 19, 2018 by britsintoronto. Some good sense from Nigel and his friend James. However, a couple of points I would mention. We know now the PM said we must maintain the uprating for the EU pensioners. Originally she referred to the need to make a new Reciprocal Agreement, (RA). We all new, most MPs new, but apparently no one had told the PM that RAs were not required to uprate pensions. More recently she dropped the word Reciprocal and referred to “an agreement”, (so our campaigning on that line has now got through). An agreement to maintain uprating for the EU guys. The Pension Act does that in Part 1 section 2. You are entitled to the State Pension only depending on your contributory years. It is domestic legislation and as the governments audit body says no need to refer to other counties for the implementation of that Act. It is another domestic legislation, the Infamous negative procedure of introducing a regulation, (SI) that allows the withholding of uprating pensioners for some overseas pensioners. The Pension Act does not say a regulation MUST be made to do so. It says a regulation MAY be introduced to do so. 1) “we cant afford it”. Rubbish! NIS contributions exceed the outlay and 2018/9 balance will be £2.2 billion above the legally required balance. 2) “There is no RA”, Rubbish! Even the PM now knows they are not required to uprate pensions. 3) “we only uprate where we are legally required to do so”. That “legal requirement”? the sneaky back door negative procedure S.I! They have no justifiable reason to withhold uprating. Their 3 “reasons”, (feeble excuses), are now well flawed. It is Just an outdated, (70 years outdated), political whim. (Perhaps I should mention that the PM backed uprating the EU guys because if she did not there would be a stampede from just across the channel and she would be on the dole queue! US FPs? Scattered round the world, too old or incapacitated in some way, (including financially due to their frozen pension), to camp on her doorstep. Your not alone James in “frothing at the mouth” over the amount the UK government have stolen from you! (of course you would get no health cost bills, you would get a free bus pass and TV license etc). The government refer to “export benefits”. We must not accept the governments dirty trick of classing the State Pension as a benefit! IT IS AN ENTITLEMENT we paid for and it will be beneficial to our future because we paid our NIS contributions, not a benefit that the government is handing out. (a big difference between a benefit and being beneficial). I consider it very important that everyone, (workers, pensioners campaigners etc), should hammer this point home at every opportunity. (ITS AN ENTITLEMENT NOT A BENEFIT!) even the ex-Pension Minister, Mr Webb just before his “retirement” from office said we, (the government), should accept the pension is an entitlement not a benefit. 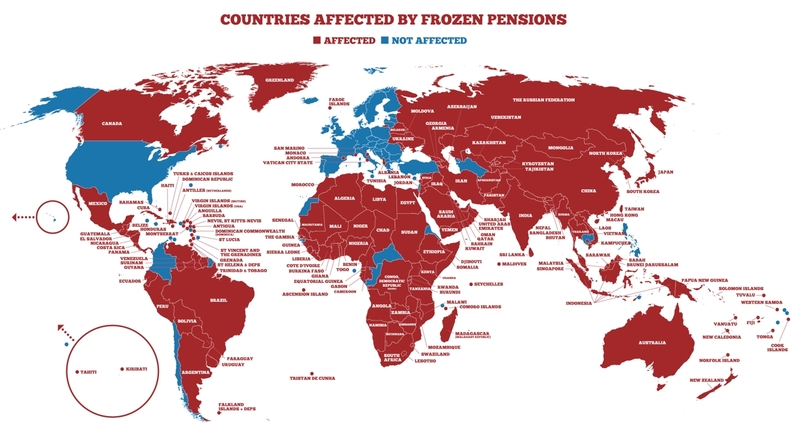 I am glad to see that Nigel referred to the 120 countries where pensions are frozen. Its not just the “big boys” Australia and Canada that are frozen. The big two if course do offer assistance to some UK pensioners but most of the other countries do not. I cant leave out the forthcoming Commonwealth meeting in London in April. Every person living in, or are from, one of the commonwealth countries should be demanding their representatives to condemn the British government for its attitude of non-compliance to the main point of the Charter, against all forms of discrimination, and to demand the frozen pension is dropped immediately and all pensioners are uprated to the current rate of the State Pension. I say demand because you have a right to demand. You pay their salaries and the cost of the trip to the meeting etc. Prior to the new Act we had one rate of State Pension. We had discrimination by the frozen pension policy. now we still have the frozen pension discriminatory but an added discrimination of two pension rates! You are spot on with your observations, and thank you for your response. The Labour Party et al could not “pray” against the negative Statutory Instrument (SI) because of the Carer’s Allowance, but we’ll come back to that in a minute. For the benefit of our readers, each year there are two SIs that are laid before the UK Parliament – the first one (which is a positive SI) gives everyone the same UK State Pension increase (at least in % terms) regardless of where they live. The second SI then takes the increase away from 550,000 UK Pensioners living in the 120 countries that we mentioned before – this is a negative SI which means that it will go through Parliament on the nod unless anyone objects. This is quite often tabled just around the Easter break. In the normal course of events, the Opposition Party (Labour) could raise what is called an Early Day Motion (EDM), and “pray” against the second, negative SI, and therefore force a vote to toss out the second, negative, SI. Here is the kicker – the Government understand this, and what would happen if there is a vote -Labour + SNP + DUP = Government defeat, so, what they now do is add an Allowance (and in this case, the increase to the Carer’s Allowance) to the second, negative SI. They know that the Opposition Party will not try to vote down what is an increase to the Carer’s allowance – they would never get the votes. So, now we move on to the Commonwealth Heads of Government Meeting (CHOGM) in London in mid April. As you can imagine, all octogenarian frozen pensions have lost a lot of State Pension money over the years. This is a shabby way for any Government to treat its pensioners – some of them fought for their Country and were proud to do so. The “big two” frozen country governments – Australia and Canada have been, and continue to be, very supportive and we hope that frozen pensions can get onto the CHOGM agenda next month.